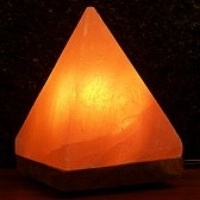 High-end decorative 6 1/2" Himalayan Crystal Rock Salt Pyramid Lamp comes complete with UL approved 110V light bulb. This high-end decorative pyramid-shaped lamp is 6 1/2" in tall and weighs 4 lbs. and comes complete with UL approved 110V light bulb. The hardwood base is 5" x 5". When the rock salt crystal heats up, it emits negative ions. These ions cleanse the air by removing dust, pollen, dander and cigarette smoke. They also offset the harmful radiation produced by computer monitors, TVs, and other electrical devices.